Bach’s St John Passion combines the words of an ageing eyewitness of Jesus’ crucifixion, reflecting on what must have been the most influential event of his lifetime, with music by a deeply Lutheran composer to whom the Reformation will have given these words new urgency and depth. The narrative, taken from the German Luther Bible, is attributed to the apostle John, “the disciple whom Jesus loved”. Bach set his testimony to exquisite recitatives which our soloists will interpret for you, with regular interjections from the choir in the guise of various crowds. The stunning arias and reflective chorales, based on hymns familiar in Bach’s time, provide moral summaries of the events. 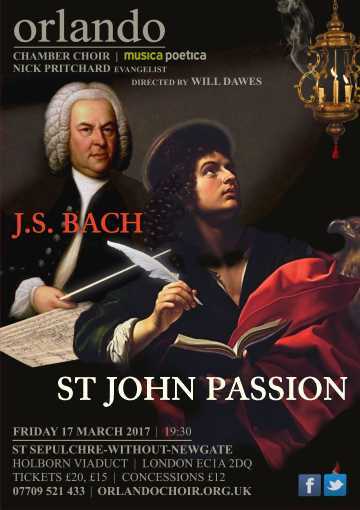 With its colourful orchestral accompaniment, Bach’s St John Passion paints an expressive and immediate picture of Jesus’ last few days, conveying the anger, fear, resignation and joy in the various voices – and once again impressing and moving the listener with this timeless story of sacrifice and salvation. The chorus Ruht wohl, almost at the end of the passion, is famously hard to sing, not for technical but for emotional reasons. Another emotional aspect to this concert is that it is Will Dawes’ last as Orlando Chamber Choir’s Musical Director. Will has been appointed Director of Chapel Music at Somerville College, Oxford. Please join us for a passionate send-off!